Charge Only Cradle Kit. 1D Laser Scanner, Wi-Fi/Bluetooth, Windows CE 5.0, Color Display, Numeric Keypad. Includes charge only (non-communications) cradle, power supply, and USB cable. Does not include country specific line cord. Charge Only Cradle Kit. 1D Laser Scanner, Wi-Fi/Bluetooth, Windows CE 5.0, Color Display, Numeric Keypad. Includes charge only (non-communications) cradle, US line cord, power supply and USB cable. Charge Only Cradle Kit. 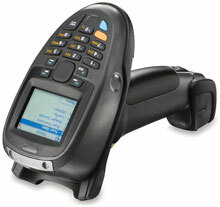 2D Imager, Wi-Fi/Bluetooth interfaces, Windows 5.0 CE, Color Display, Numeric Keypad. Includes charge only (non-communications) cradle, power supply, and USB cable. Requires the purchase of a country specific line cord. Charge Only Cradle Kit. 2D Imager, Standard Range, Wi-Fi/Bluetooth interfaces, Windows CE 5.0, Color Display, Numeric Keypad. Includes charging (non-communications) cradle, US line cord, power supply, and USB cable. Starter Kit Bundle That Includes the PDT and Charge Only Cradle - Wi-Fi (802.11a/b/g), High Density 2D Imager, Bluetooth, Windows CE 5.0, Color Display, Alphanumeric Keypad. Kit includes USB cable, charge only (non-communications) cradle, power supply, and US line cord. Kit. Includes 802.11/Bluetooth Terminal With Hd Imager (MT2090-Hd0d62170wr), Single Slot Charge Only Cradle With Active Sync, Cradle Power supply, US AC Line Cord and Communication Cable. When connecting with wifi can be difficult, it seems easy but I wasn't sent a manual - just easy setup instructions which did not help.